A prenuptial agreement helps to define the obligations of both parties in the event of divorce or death. When you are considering marriage, it’s a joyous time. In legal terms, marriage is a contract with financial rights and obligations. When it’s time to set up a prenup and you need a prenuptial attorney in Joliet, contact DeVriendt & Associates. Communicating about financial matters is extremely important and creating a prenuptial agreement together provides a strong base for the future. If you have inherited money, you make more money, you have children from a previous marriage or you own your own business it is important to have a prenuptial agreement in place. It’s important to have a prenuptial attorney on your side. Call to schedule your consultation today when you need a prenuptial attorney in Joliet. Whether you agree on the terms of your divorce or you can’t agree on anything, you need a family law firm with experience. DeVriendt & Associates can help. We will guide you through the complex issues of divorce, spousal /child support, child custody and property division and come up with a plan that will help reduce stress. As a Joliet family law firm, we take the time to understand all the details of your case. We have a team of caring, competent professionals who have the skill and wisdom to represent your best interests. Our forensic accountants have the experience to protect your retirement accounts and any money issues and we also have experience in child custody, visitation and support. Making the decision to hire a family lawyer can be difficult. When you need a Joliet family law firm call for your consultation today. At DeVriendt & Associates our lawyers understand that divorce is a highly emotional and stressful time in an individual’s life. If you are looking for a divorce lawyer, you need someone who understands the financial and emotional toll this will take. As a Joliet divorce lawyer, we provide the honest and straightforward legal representation you need. As a divorce lawyer, we want to ensure that any disputes associated with your case are given proper consideration. We will handle your personal and financial affairs with the attention to detail you deserve. Often the children become pawns in a divorce. We have experience negotiating issues involving child custody, support and visitation. We also have extensive experience in forensic accounting to ensure property settlements and spousal decisions are based on the true value of your assets. When you need a Joliet divorce lawyer, call for your consultation today. Divorce is a highly emotional time in an individual’s life with significant personal, financial, and emotional impact whether the issues involved are contested or uncontested. 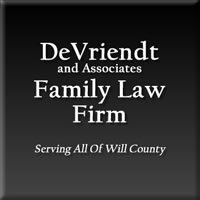 As a Joliet divorce attorney, DeVriendt & Associates specializes in Family Law, Divorce Law and Child Custody. We provide honest, straightforward legal advice and representation you need for this delicate situation. We have experts in forensic accounting to make sure your finances are protected and your marital estate is divided equally. As a Joliet divorce attorney, we handle your financial and personal affairs with the attention to detail necessary to ensure any disputes associated with your case are given the proper consideration. We are also experts in child custody helping you with visitation, custody and child support. When you are looking in Joliet for a divorce attorney, call and schedule your appointment today. At DeVriendt & Associates we understand that divorce issues concern more than just laws, they are about the families involved. As a female divorce lawyer in Joliet, your family is at the heart of everything we do. We know that every situation is unique. As a woman it is comforting to have representation from a woman who understands your circumstances. We have extensive experience negotiating issues of child custody, child support and visitation. As a female divorce lawyer, we understand how important the children are and it is a priority to protect their welfare. We also have experience handling forensic accounting to ensure that property and spousal support are based upon all marital assets. We will protect your retirement and 401Kplans and make sure you have the ability to earn a living. Whether you are fighting for your children or your assets, when you are looking for a female divorce lawyer in Joliet schedule your consultation today.